When it comes to buying a vehicle, people think they have 3 options: finance a new vehicle, lease a new vehicle, or buy a pre-owned model. Here at Toyota of Killeen, we want to remind you that there is another over looked choice that can be the best of the new and used world, and it’s called ‘Certified Pre-Owned’! Not every used Toyota model can earn the CPO qualification. In order to do so, the vehicle has to meet specific model year criteria, cannot exceed certain mileage limitations, and cannot have gotten in any serious accidents. The car, truck, SUV, or crossover will even go through a rigorous 160-point quality inspection that will review major components down to cup holders! Extended Warranty Coverage(items 1,2 and 3 above) transferable at no coast for added resale value. Legal Disclaimers:  Whichever comes first from date of Toyota Certified Used Vehicle purchase. The Limited Comprehensive Warranty covers any repair or replacement of components which fail under normal use due to defect in materials or workmanship. (Program not available in Hawaii.) Whichever comes first from original date of first use when sold as new. See your Toyota Certified Used Vehicles dealer for warranty details. Program not available in Hawaii. For AL, FL, GA, NC & SC, warranty coverage differs in the following ways: 7-year or 100,000-mile Toyota Certified Limited Powertrain Warranty coverage begins on January 1st of the vehicle’s model year and zero (0) odometer miles and expires at the earlier of seven years or 100,000 odometer miles. From date of Toyota Certified Used Vehicle purchase. Covers most services, including flat tires, lockout service, jump starts, fuel delivery up to 3 gallons and towing for mechanical breakdown or collision recovery to the nearest Toyota dealership. Services provided exclude any parts required. Coverage not available in Mexico. See Certified Warranty Supplement for warranty details. Beginning December 1, 2005 CARFAX® Vehicle History Reports? are a required part of every Toyota Certified Used Vehicle. See your local dealer for details. Rates mentioned are for standard new car rates, and do not include new car specials or subvented rates. Not all buyers will qualify. Financing available through Toyota Financial Services for qualified buyers only. 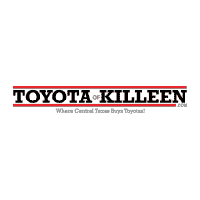 Toyota of Killeen	31.081384, -97.701518.